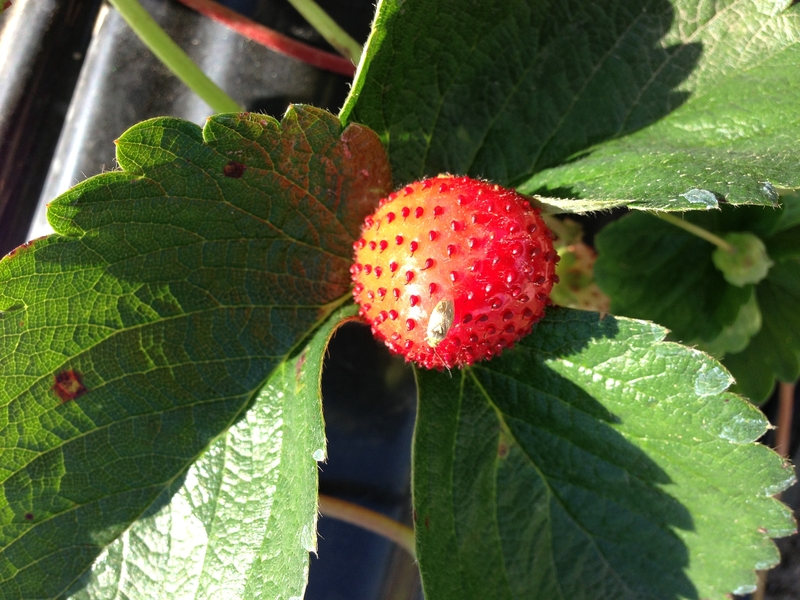 Western tarnished plant bug (Lygus hesperus), also known as lygus bug is a major pest of strawberries. Feeding damage results in misshapen fruit which is not marketable. Lygus bug is the target of several pesticide applications and keeping it under threshold levels continues to be a challenge for growers. 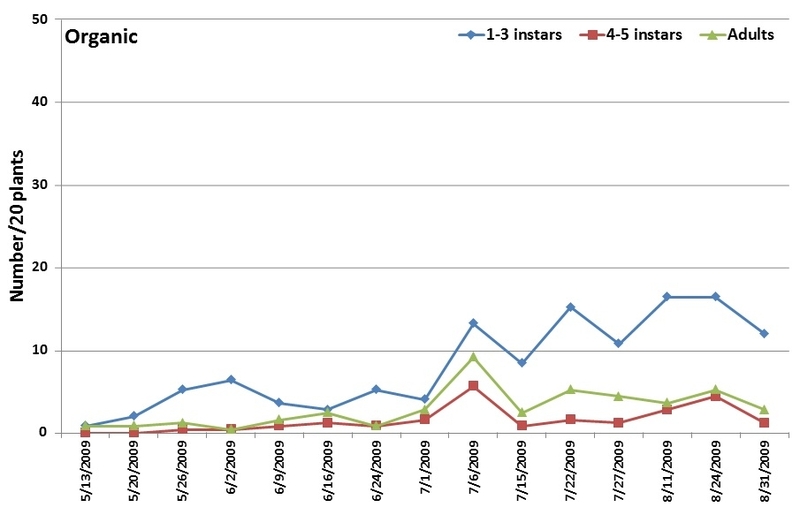 In 2009, one organic and two conventional strawberry fields in Santa Maria were monitored for two to three months between mid-May and the end of August at periodic intervals. On each observation date, 10 random plants were sampled using a beating tray from each of five different parts of an approximately 5 acre area. 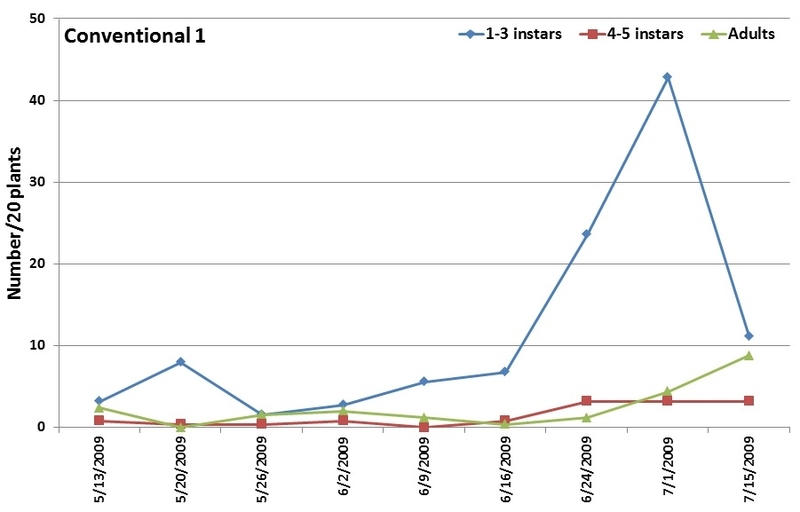 The number of young (1st to 3rd instar) and mature (4th to 5th instar) nymphs and adult stages of lygus bug were counted. Two pyrethrin applications were made during the observation period in the organic field. 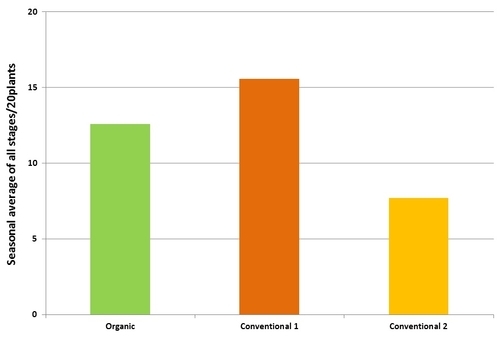 Conventional field 1 received nine pesticide applications between early May to early July in the following sequence: fenpropathrin, naled+novaluron, naled, fenpropathrin, naled+novaluron, bifenthrin+novaluron, malathion+novaluron, malathion, and naled. 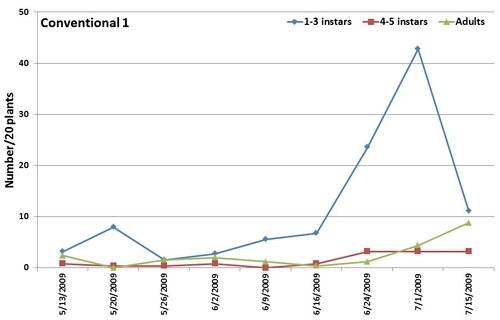 In the Conventional field 2, six pesticide applications - fenpropathrin, malathion, bifenthrin+malathion, malathion, thiamethoxam+malathion, and bifenthrin – were made from mid-May to the end of July. 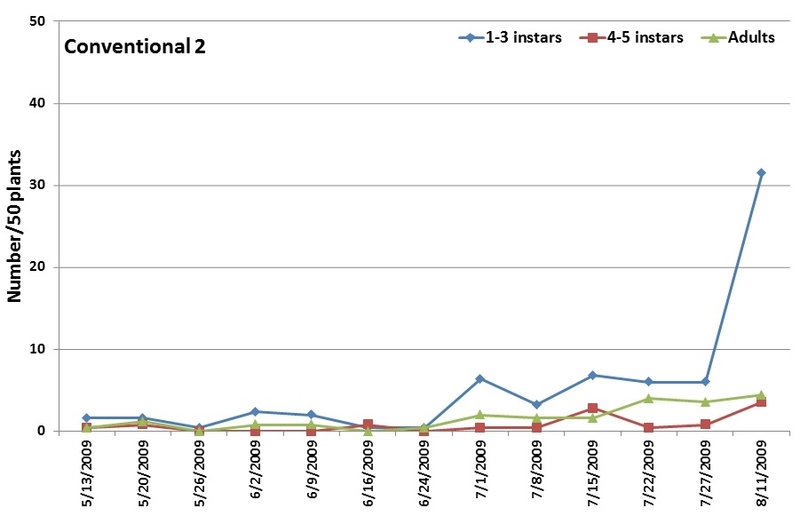 Regardless of multiple treatments, lygus bug numbers increased in all fields as the season progressed. In general, a higher number of younger nymphs was seen in all fields followed by adults and older nymphs. Lygus numbers remained above the treatment threshold (1 lygus bug nymph per 20 plants) on almost all observation dates in both organic and conventional fields. There was no particular trend in pest populations in response to the pesticide applications or the system of farming. 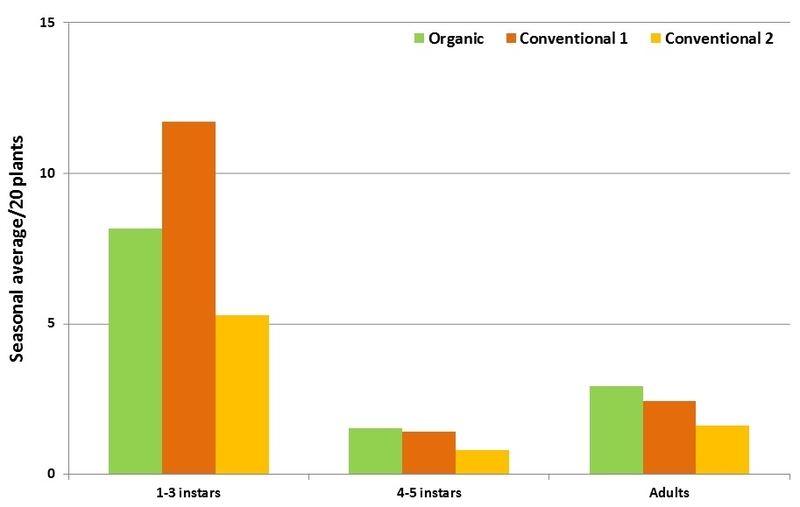 Lygus bugs were above the treatment threshold in conventional fields with multiple pesticide applications as well as in the organic field with fewer spray applications and emphasis on natural enemy conservation. 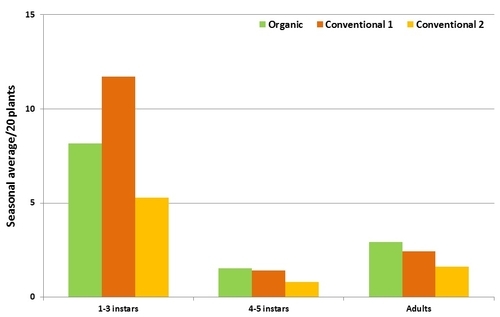 When the seasonal average for all life stages was considered, the highest number was found in conventional field 1 (15.6/20 plants), followed by the organic field (12.6), and conventional field 2 (7.7). 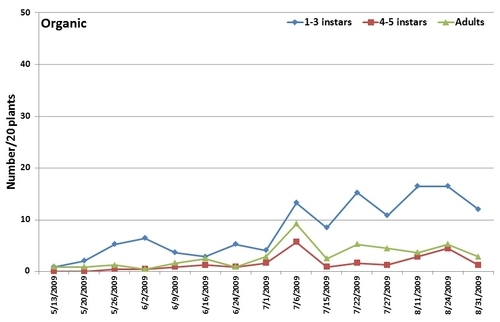 Number of young and older nymphs and adult lygus bugs in conventional (top and middle) and organic (bottom) strawberry fields in Santa Maria in a 2009 study. Seasonal average (average per sampling date during the observation period) for various life stages of lygus bug in organic and conventional strawberries in Santa Maria. Seasonal average of all life stages of lygus bug combined in organic and conventional strawberries. This study shows that lygus bug is a difficult pest to manage and necessitates the need for better management practices. Recent IPM studies (Dara 2013 and Dara 2014) with existing and new chemicals, botanical, and biopesticides showed promising results. Dara, S. 2013. Field trials for managing aphids on broccoli and western flower thrips on lettuce. April issue of CAPCA's Adviser magazine, pp. 29-32. Interesting piece of work here Surendra. Notable is that in all cases numbers of small nymphs are higher than the other two stages. Clearly, there is a lot of mortality of these stages as they move to later instars and adult. You want to speculate on what might be the cause of that mortality? Seems once that is identified, growers could take advantage of it. Thanks for your note. Grower applied malathion and novaluron on June 27 in Conventional field 1. That could have been the reason for a drop in the younger nymphs. But you can also see a slight increase in older nymphs during that time indicating that some of the younger ones are maturing into 4th and 5th instar nymphs. 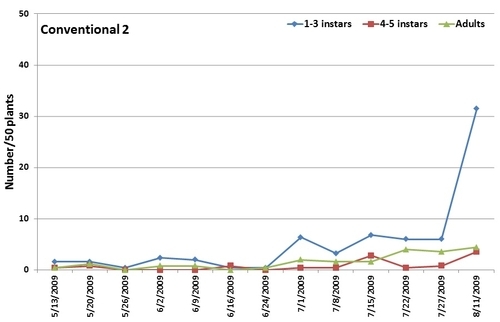 Lygus populations showed a general increase regardless of the treatments in this study.